World Is Our Classroom, Inc., a 501(c)(3) nonprofit entity, aims at making education more interesting, varied and effective by moving it beyond school walls. We construct self-sustaining entities that have a measurable impact on our target audiences. We want to help educate today’s children and inspire tomorrow’s workforce. Given what WIOC has accomplished, and can accomplish, we believe your organization will want to get involved. Please contact us at (413) 787-0008 or nora@worldisourclassroom.org to learn how you can help. Please contact us at (413) 787-0008 or nora@worldisourclassroom.org to learn how you can help. 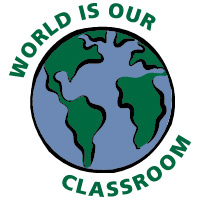 WORLD IS OUR CLASSROOM, INC.